Balneário Piçarras preserves its charm and attracts visitors because of its fascinating seashore. If you go to Bombinhas you will find out why the place holds the title of Jóia Rara do Litoral - Rare Jewel of the Coast. In Camboriú, the natural corners amidst the rural landscape will allow you moments of relaxation and leisure. Ilhota, besides being known by its natural characteristics, is also recognized as Santa Catarina's Capital of Underwear and Beachwear. Itajaí presents several attractions for leisure and culture and beaches that are perfectly integrated to the urban rhythm of a seaport town. Located in a beautiful seashore scenary, Itapema is considered Santa Catarina's Capital of the Ultralight Crafts. Cosiness, tranquility and a simple way of life is what turns Luis Alves into the ideal place for resting among nature. 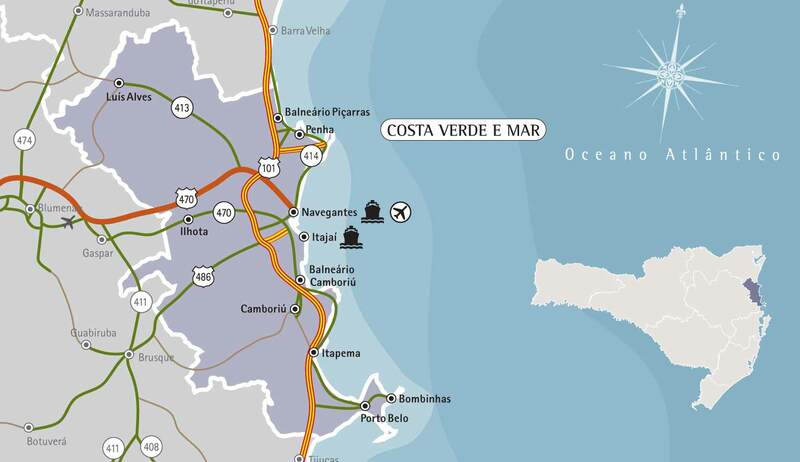 Navegantes has beaches with clean water, ideal for adventure, sports or simply to enjoy life. Penha - the town where Beto Carrero World Park is located - joins leisure, beaches, gastronomy, nature and the atmosphere of a fishermen village. Landscapes that enchant and beaches that seduce in a bay full of unique beauties is what you will find in Porto Belo.